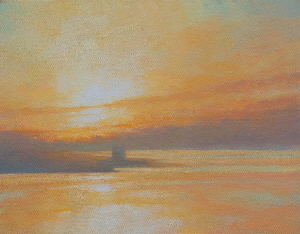 The main elements and composition was painted on the spot as the sun rose. There was an overwhelming “Yellowness” for a period during this sunrise that I wanted to bring back to the studio to develop but not to change too much. A glorious morning, still and bright.